50% Carignan, 25% Syrah, 25% Grenache. 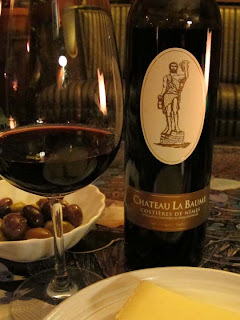 I was excited to revisit this wine recently and found it to be even better than I first recalled! Deep dark ruby in color, it has brighter red highlights. An initial whiff brings to mind an earthy gaminess, like the forest floor in autumn. Spicy notes on the back palate are interwoven with the subtle perfume of violets and a soft mouth feel (most likely from the syrah). By day two, juicy buoyant red berries mingle with a touch of fig, huckleberry, eucalyptus and even some charred earth. By that time the wine finds more resolve, integration and weightiness along with a lovely dry finish. Background info: The winemakers, Jean-Francois and Sandrine Andreoletti reside in the Rhone region in southern France, specifically the appellation of Costières de Nîmes near Chateauneuf du Pape. The sunny, herb scented, lavender and olive rich Mediterranean expresses itself through the terroir, the finesse of the winemakers and thence the wine. The soil is clay and schist. Carignan vines are 50-60 years old. The Bacchus image on the label was originally used in Roman time as a shop sign, while the name “La Baume” means cave. Food pairing: On the simple side, you could enjoy this with some French Comte’ cheese, mixed olives and baguette (as I did on the day of tasting). I could further imagine enjoying it with lamb chop and roasted rosemary potatoes or lamb sausage, falafel and hummous for a real Mediterranean feel. This is an amazing every day wine at $11.99 a bottle! It comes to us here in Portland from the illustrious Devenish Wines (http://devenishwines.com/) and can be found at Rosemont Market. I found it at the Munjoy Hill location – 88 Congress St.